It’s never too soon to starting thinking about what to put on your holiday meal menu—especially if you’re hosting a vegan feast. To put together an epic vegan Thanksgiving meal, there are a few components to keep in mind: You need a bunch of delicious sides (yes, that totally includes all the sweet potato casserole and stuffing), a melt-in-your-mouth dessert, and, of course, a meatless main dish that makes guests forget turkey is even a thing. 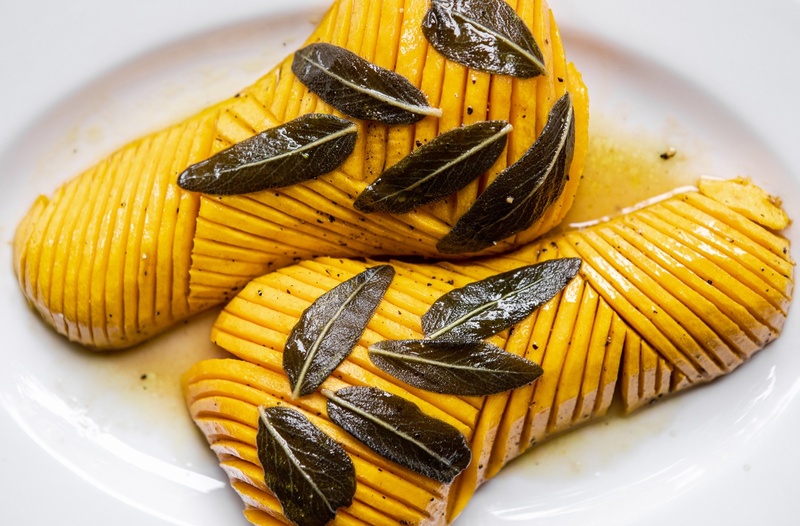 And it just so happens that a certain seasonal food staple is the alternative that’s stealing the show: butternut squash. While there are plenty of meat-free main options you can buy—like Gardein Savory Stuffed Turk’y (my favorite!) or the standard Tofurky Plant-Based Roast—you can also carve yourself a picture-perfect turkey from the turmeric-hued veggie. Greenhouse Juice Co., a Canadian plant-based juice company, created a recipe for glazed butternut squash that’s said to impress even the most hard-to-please relatives. And, bonus: This meal doesn’t take nearly as long to make as a turkey. Oh my gourd—Glazed Butternut Squash. Brushed with a plant-based butter, maple syrup, and Farma-C glaze, then topped with fresh sage, this roasted local veg will butter up even the pickiest eater at your Thanksgiving table. Tap the bio link for the recipe. These delicious vegan Thanksgiving recipes bring more to the table than turkey. Or, find out what to watch post-Thanksgiving to keep the festive mood going.